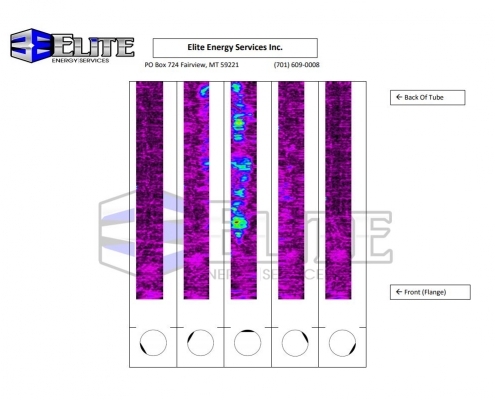 Elite Energy Services has developed the internal MFL pipe scanning system. The wheels are custom fitted for each scanning head to allow a specified distance between the scanner and the metal. This allows highest accuracy in determining the level of corrosion on the fire tube. A specially designed pole is able quickly attach to the scanning head to move the scanner in and out of the fire tube. This pole can be different lengths depending on whether the fire tube is in a vertical or horizontal heater treater. The encoder wheel measures the distance the scanner moves into the fire tube. This creates the ability to know the exact location of the corrosion inside the fire tube. The large handles on the scanning head are used to remove the scanner from the metal. The magnetism created is very powerful and requires leverage to remove it from the surface. MFL stands for Magnetic Flux Leakage testing. 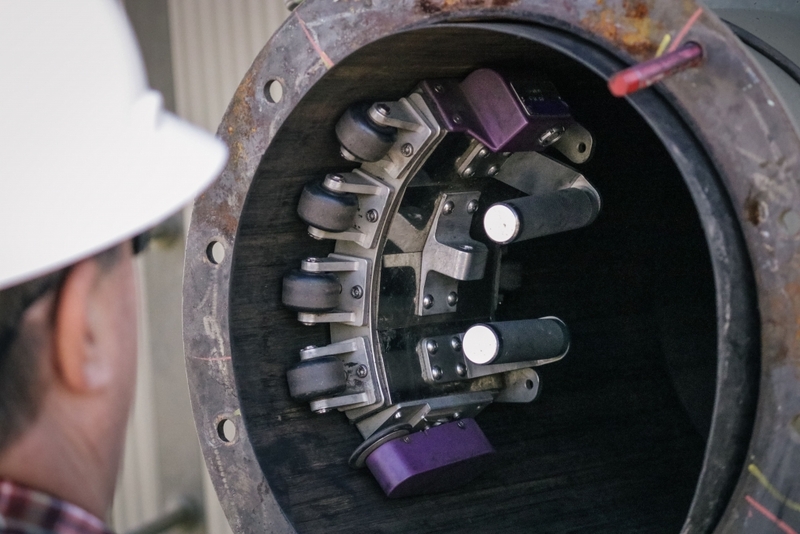 It uses a combination of magnets and sensors to determine defects in carbon steel by measuring the resistance as the scanner passes over the steel wall. MFL technology has existed for about 15 years and is commonly used to scan tank floors and down hole pipe testing. 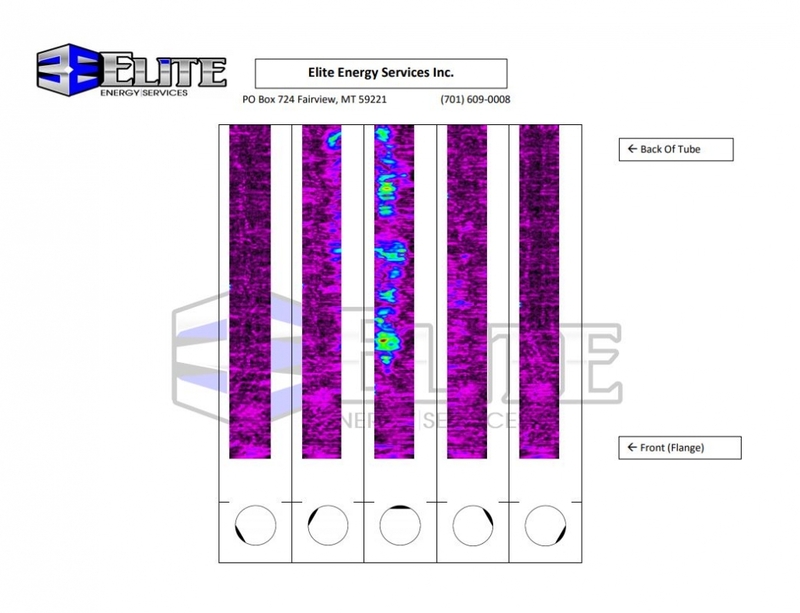 Elite Energy Services harnessed this robust technology and worked with vendors around the world to build an application specifically designed for fire tube scanning. What is unique about the scanner? 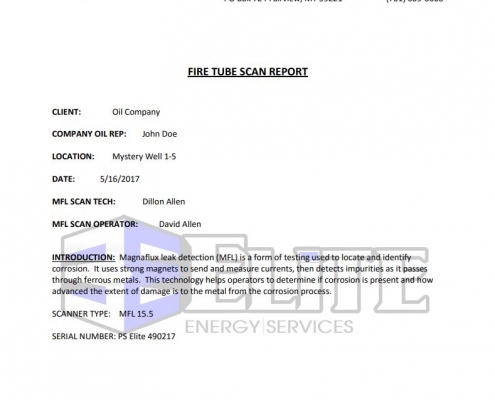 The Elite MFL Tube Scanning system is purpose-built for the inspection of fire tubes – the first of its kind. 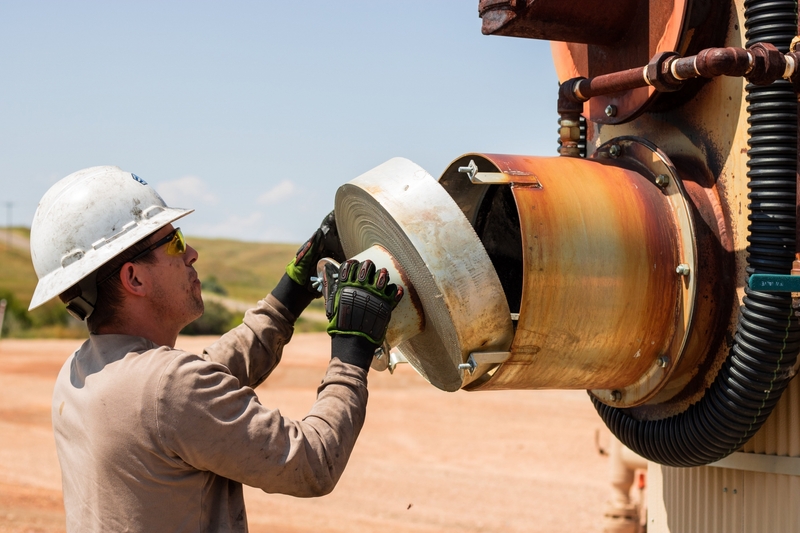 Our sensors and magnets are curved specifically to the inside of a fire tube, allowing us to efficiently determine the levels of corrosion and areas of weakness. The scanning heads are custom made for multiple I.D. (inside diameter) fire tubes, and this makes the system extremely accurate (+/- 3%). How do we use magnets to measure the corrosion in a fire tube? When magnets pass over the metal, the force of the magnets create resistance in the carbon steel. When there is corrosion in the steel, it causes defects, and the metal in the affected area becomes thinner. This causes less resistance when the magnets pass over. The sensors then measure the resistance – and software translates that information into a numerical format, which is then calculated to determine the remaining wall thickness. Our software produces an image, giving our customers a visual representation of the orientation and location of corrosion on the fire tube. 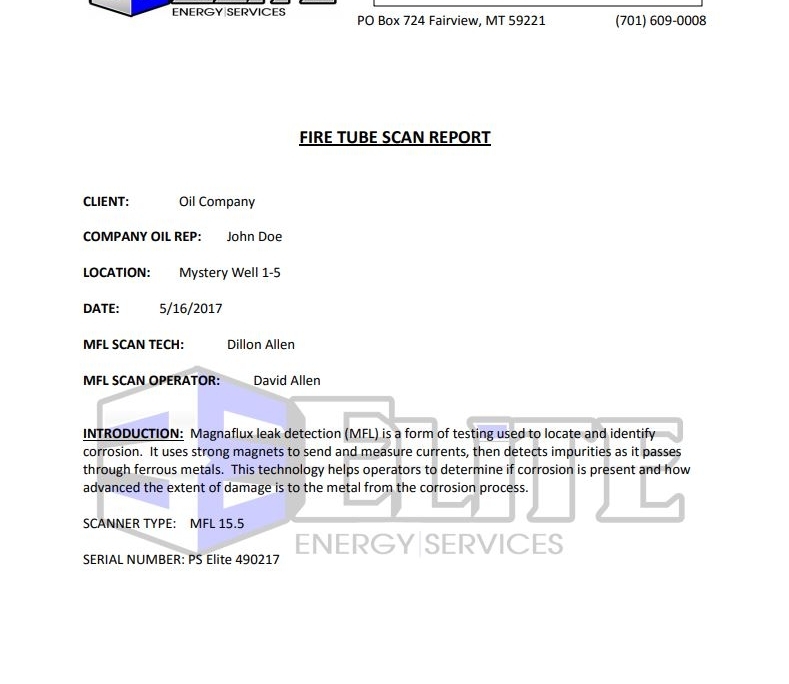 These readings are instantaneous and allow our operators to quickly diagnose the corrosion damage on the fire tube. 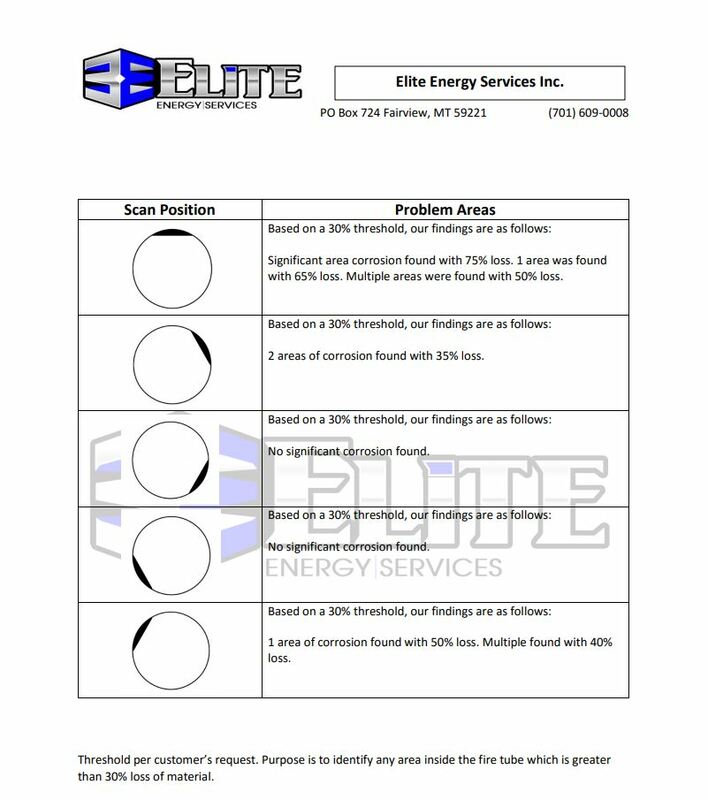 Elite’s scanning process is fast, effective and most of all SAFE. The burner assembly is removed after the fuel gas lines have been secured and rendered safe. The arrestor and burner are removed and set to the side. A visual inspection of the inside of the tube is completed. If any issues are found, they are noted and later addressed by the producers. If a heat shield is present, the team will remove the shield to ensure safe working conditions. The fire tube must be free from debris – such as soot, scale and rust. This is accomplished with specially designed brushes that loosen the material so it can be removed effectively. We use compressed air to facilitate the preparation process. Once the tube has been cleaned, the scanning process can begin. The scanner head is deployed into the fire tube, starting in the 12 o’clock position. The scanner head is pushed forward, travelling over the steel tube and sending data to the computer. The information is then translated by the software and a digital image is produced. 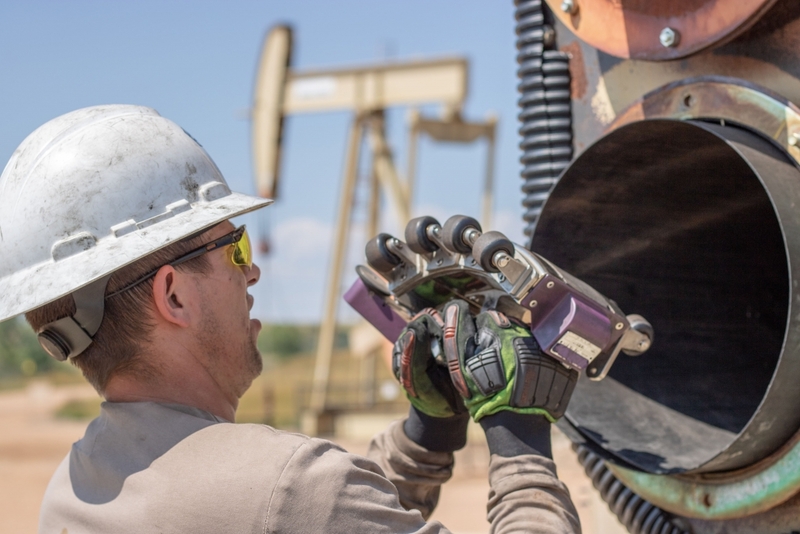 The operator and producer can then determine the depth and location of the corrosion. This process is repeated until the entire fire tube has been scanned. If the tube has significant damage (75%+ or as otherwise instructed), a call is immediately placed to the producer for necessary interventions. Once the data has been collected and interpreted, the reassembly process begins. If a heat shield was used, it is replaced and re-positioned. The burner assembly is reinstalled and secured to the fire tube flange. If the burner was lit before the disassembly process began, it is then re-lit and the arrestors are placed and secured. The reporting process was developed to be easy to read, straight forward, and a document that could be used by oil producers to answer the simple question: Is the tube “good or bad”? 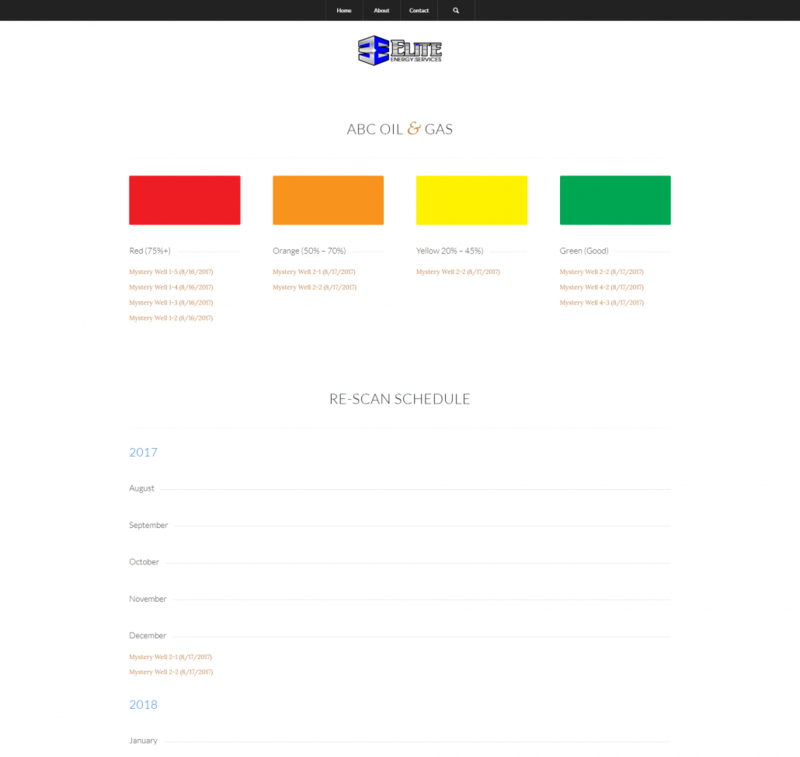 We wanted to ensure the information in the report could be universally understood, so we have developed a color-coded system that allows the level of severity to be quickly identified. The color GREEN, for example, indicates a tube that can be addressed at a later date. A YELLOW/ORANGE tube can be delayed and/or monitored more closely. The color RED, however, designates a tube needing expedited action (or 75%+ of wall loss). If we detect a RED designation on the report, the producer is notified immediately and can inform other company personnel to the priority of that particular tube. The report also uses positions on a clock (12 o’clock, 4 o’clock, etc.) to describe the location of the corrosion. A root cause analysis can be made to determine why the area is having corrosion issues. Data management is key to any efficient inspection program. Our data management system was developed with the producer in mind. We know our customers want something quick, easy to interpret, and requiring little scrutiny. We used these parameters to develop our Fire Tube System. We have color-coded the results so that you can easily determine which tubes are a priority. Red’s require quick action and green indicates the fire tube has minimal corrosion damage. Each morning, producers receive an email with a table listing wells scanned the day before. The table shows the percentage of wall loss and the corresponding priority indicating color (RED, ORANGE, YELLOW, GREEN). Producers can quickly determine if and when to address any fire tube issues. Producers can easily view these alerts on their phone or while at their computer. Once the producer determines when they wish to rescan the tube (usually in months), the email is sent back to Elite for processing. 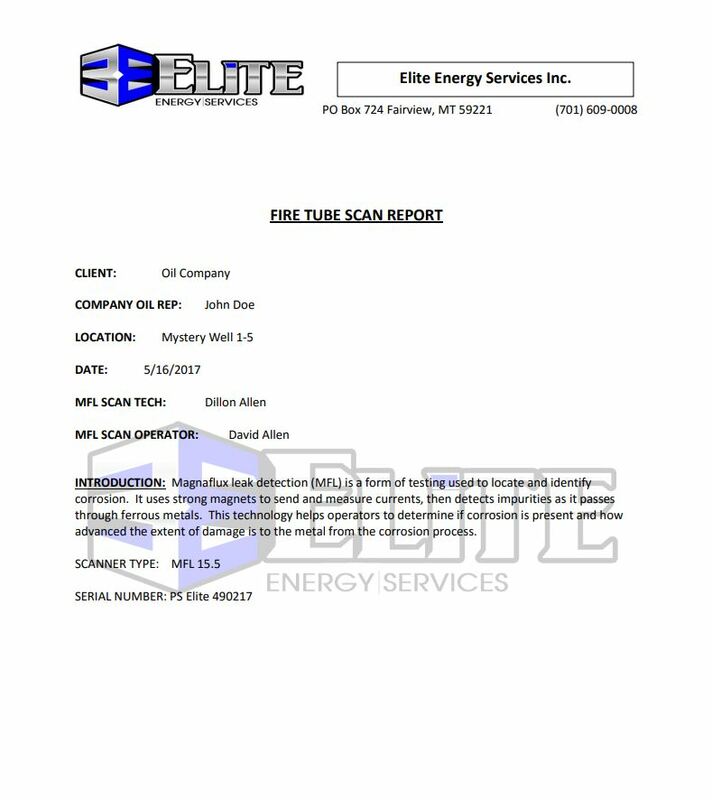 Elite will then move the scan data to the appropriate place in the calendar and the report will be stored for future viewing. The database is kept on a secure web-based platform. Only authorized personnel have access to their respective companies. Using this type of platform enables the reports to be archived, and easily accessed from multiple devices. Access the system from the office or out in the field. These are some of our most asked questions about the scanner. How many passes does it take to scan a fire tube? Depending on the diameter of the fire tube, typically 5-6 passes are made inside the tube. This entails taking the scanner in and out of the fire tube 5-6 times in order to complete the full diameter of the tube. The scanner itself does 10” passes at a time. Do you scan the top of the tube? As we researched the issues related to fire tube failures, 99% of failures occur in the bottom fire tube. The direct flame contact from the burner will increase the rate in which steel will corrode, most typically seen as hot spots. We can scan the top of the fire tube, – but do not recommend it as the lower portion will corrode much quicker than the top. The scan itself can be done in less than 30 minutes. The prep process is typically the most time-consuming part of the inspection as the surface needs to be relatively smooth and free of debris. Do you relight the burner? We do relight the burner after the inspection has been completed and the burner is reassembled. We leave the treater functioning the same way it was found; if the burner was turned off we do not relight it nor do we adjust the burner unless specifically asked to do so. Do you have to shut down production? No, and that’s what makes this system so efficient and user friendly. Nothing is impacted on location in order for us to inspect the fire tube. The treater vessel can remain full of fluid, – and the well may also remain in production. The only impact we have is turning off the burner. Does cold weather affect the results? Weather does not affect the results of the inspection. Does scale and build up impact the scan? Any build up that occurs inside or outside of the fire tube does not affect the results. By using a MFL, we are only measuring the resistance in the steel and do not have any false readings due to scale build up as a result. Scale build up has no impact on the scanning results. How is the data received? Data is received instantaneously through our software, which is built into the system. 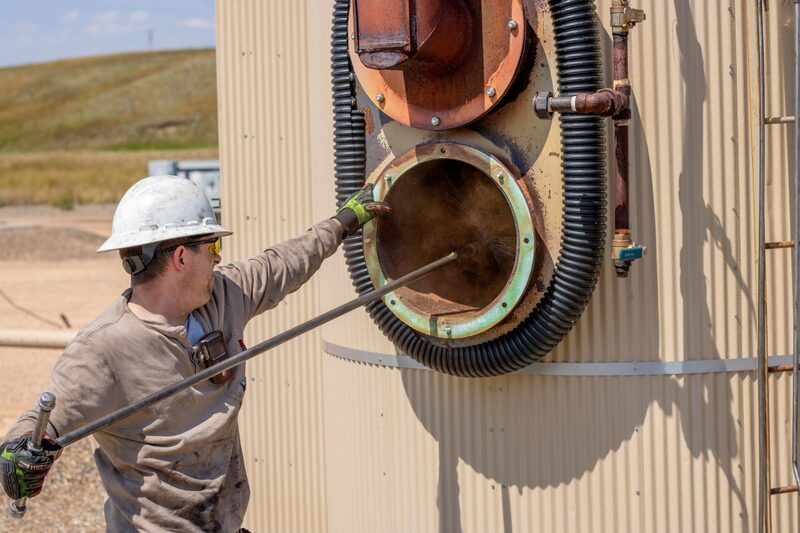 The onsite staff can determine the current state of the fire tube within seconds after inspecting. Is this process recommended annually? We base rescans off what the fire tube is “telling us”. For example, if we find a fire tube with corrosion at 50% wall loss, we would look to reinspect that fire tube in 3-6 months – this also depends on the time of year, current state of cathodic protection, and history of that vessel. What does the producer need to provide support? 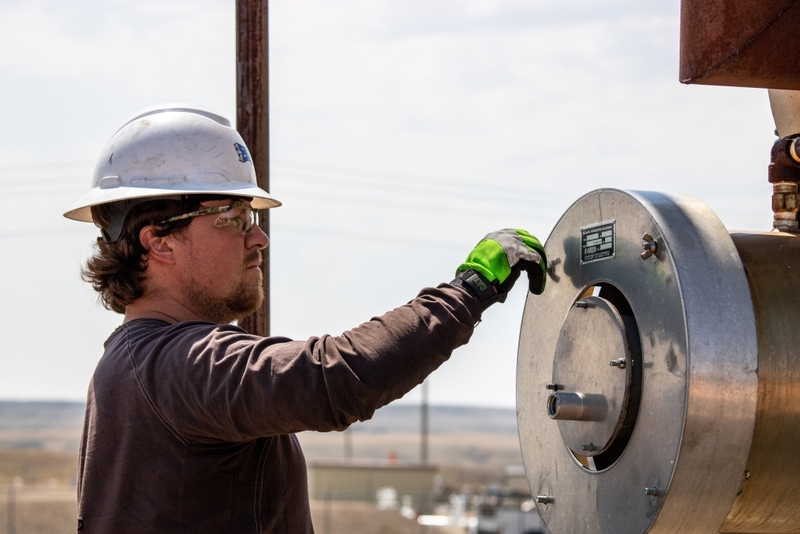 The crews operate independently, which means they are able to complete all of the safe work permits and inspections without any supervision. We only require contact information for the people needed to assist with questions, route sheets, and determine what sites are priority. How am I notified if there is a problem or a bad tube? We consider anything above 75% wall loss to be in the “RED” category. When we find a fire tube with this amount of wall loss we will make a phone call to the producer and inform them of the condition of the tube. We will always attempt to make verbal communication with the point of contact when we run into this situation, in addition to daily emails sent regarding the scan results for less affected tubes. What does this process cost me? We manage all aspects of the inspections; this includes the scheduling, tracking, and oversight. Everything including the inspection will typically cost around $500. We use a base rate. This makes budgeting and cost tracking much easier for producers. 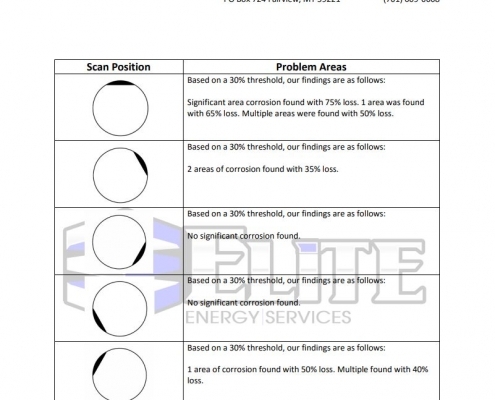 A step-by-step walkthrough demonstration of the Elite Scanning System.